It is a proud, enchantress, captivating and fascinated-by-stones woman, who opens the royal path of inspiration for the House's perfumes. The first perfume is simply an extension of Boucheron's know-how. Imagined in 1988 in the high jewelry workshops, Boucheron's original shape evokes a rock crystal ring, embellished with golden gadroons and a deep blue cabochon top, as intense as the rarest sapphires in the world. With its modern and sensual curves, it coils itself into the hand. The rarity of the mix of gold and glass and the refinery make it a precious object of desire. The Boucheron Woman: passionate and demanding, she knows how to use her innate assets. From unique to sumptuous stones, from a drop of extract to an impudent trail, she serenely shows off a triumphant femininity. Unique, Passionate, Enchanting. Explore the entire range of Perfumes (EDT & EDP) available on Nykaa. 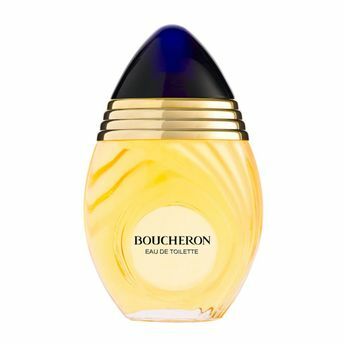 Shop more Boucheron products here.You can browse through the complete world of Boucheron Perfumes (EDT & EDP) .Alternatively, you can also find many more products from the Boucheron Eau De Toilette range.